Is this stylish Ubuntu phone ready for prime time? Not yet. Ubuntu Phone certainly has potential, and the MX4 is a very nice phone, but it's not quite enough to get most people to ditch iOS or Android. Yet. It looks like Ubuntu phones are a lot like buses; you wait ages for one to turn up, then two come along (almost) at once. After the launch of the low end, and rather unglamorous, BQ Aquaris E4.5 Ubuntu Edition, Canonical was at MWC 2015 promoting its second Ubuntu phone; the Meizu MX4 Ubuntu Edition. The Meizu MX4 can already be bought with Android installed, but Canonical has teamed up with the Chinese manufacturer to provide a version with its fledgling Ubuntu Phone mobile operating system installed, in a bid to provide a stylish Ubuntu handset. The functional BQ Aquaris E4.5 Ubuntu Edition was pushed out to get it into the hands of app developers and Ubuntu fans (they do exist), while the Meizu MX4 Ubuntu Edition is aimed at tempting early adopters and people who might not have heard of Ubuntu. A release date and price havn't been officially announced just yet, though I've been told Canonical (the company behind Ubuntu Phone) hopes to launch it in the next few months. As for price, I've been told to consider the price of the Android version as a clue, so we could be looking at around £255 (about US$392, AU$504). 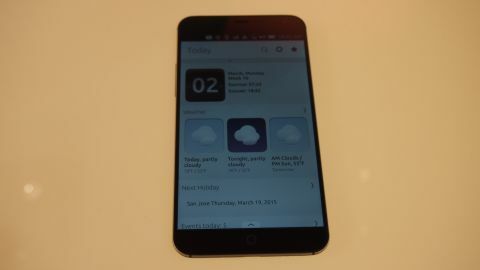 The design of the Meizu MX4 Ubuntu Edition is certainly very nice, sporting an iPhone 6-inspired design. And when I say 'inspired' I mean 'blatantly ripped off'. From the curved edges and rounded corners, to the single circular 'home' button, Meizu has kept up its reputation as a Chinese iPhone-clone company. Speaking of that home button – at the moment it doesn't do anything when pressed. The Android version of the handset features the same button, which actually functions, but at the moment it doesn't work with Ubuntu Phone. I was promised that this would change when the phone gets released. As you can guess the Meizu MX4 Ubuntu Edition is exactly the same hardware as the Android MX4, so it features the same 144 x 75.2 x 8.9 mm dimensions and 147g weight. It looks great and also feels good, with a sturdy build quality that adds to its premium feel. The alumium alloy body feels good, and a matte back cover (that's removable) keeps the handset free from finger prints – on that side of the phone, anyway. At the top edge of the body is the headphone jack and power button, and the volume rocker is located on the left-hand edge. If you find yourself mistaking the Meizu MX4 Ubuntu Edition for an iPhone 6, a cursory glance at the bottom of the phone will show you that this is no Apple created device due to a non-proprietary standard micro USB port. The screen is a 5.36-inch LCD display, running at a resolution of 1920 x 1152 for a pixel density of 418ppi. The display was certainly bright with a decent colour reproduction, and Gorilla Glass offers protection from scratches. The rest of the Meizu MX4 Ubuntu Edition are pretty impressive, with a Mediatek 6595 Octa-core processor (that's probably more powerful than many CPUs found in Ubuntu-running desktop PCs), 2GB RAM, and a 3100mAh battery. The Meizu MX4 Ubuntu Edition will come in three capacities; 16GB, 32GB and 64GB. Rather disappointingly there is no option to expand the storage space with a MicroSD card. Connectivity is covered with dual 4G SIM card support and 802.11ac Wi-FI. The rear camera is an impressive-sounding 20.7MP snapper from Sony and capable of 4K video, should you want to take that sort of footage. Although my hands-on time with the Meizu MX4 Ubuntu Edition was in the less than ideal photography conditions under the bright lights of MWC, the still images that I took we rather good, with an impressive level of detail. Ubuntu Phone's camera app is relatively simplistic, sharing a similar paired down feel with Google's stock Android camera app. There are HDR, time and shot composition options, and you can choose between fine, normal and basic quality settings for the photos. Focusing is handled by touching the screen, and a big onscreen button allows you to take shots – sadly there is no physical camera button on the device's body. Video quality was less impressive, and you wouldn't think by viewing the footage that it was 4K – on the device anyway. I didn't get a chance to view the footage on a proper 4K screen, but my time with the Meizu MX4 Ubuntu Edition left me with the impression that video recording isn't its strong suit. A 2MP front facing camera does the job, but that's sort of damning with faint praise. While the Meizu MX4 Ubuntu Edition is a stylish and powerful handset, what really makes it stand out from the crowd is the Ubuntu Phone operating system. This eschews the traditional grid layouts of iOS and Android, and instead provides 'Scopes', which aggregates information from various services and puts them within easy reach. The results are interesting, but it does mean you sometimes need to swipe between quite a few screens to find what you're looking for. You can also bring up a list of Scopes by quickly flicking up from the bottom of the screen, or by a long slow swipe from the right. The interface does take some getting used to, though it is very fast and responsive on the Meizu MX4 Ubuntu Edition thanks to its impressive specs. What doesn't help is that there's no home screen to return to, which can sometimes leave you a bit lost and confused. Ubuntu Phone isn't without its bugs either, with some websites and apps not displaying properly. Volume controls can also cause the phone to slow down. The volume rocker also presents another problem currently, as to take screenshots you press down both sides at once. At the moment this takes a screenshot, but with the onscreen volume indicator showing as well. App support is limited at the moment, for example there is no default email app installed on the Meizu MX4 Ubuntu Edition. I tried the Gmail app (which was actually just the web app), which didn't display properly. Canonical (the company behind Ubuntu Phone) recommends the Dekko app, but by their own admission it's currently very basic. Ubuntu Phone has plenty of potential, but at the moment most people will be frustrated with the limitations and instability of the software. Cristian Parrino, Vice President, Mobile and Online Services at Canonical, told me that they aim to make Ubuntu Phone ready for mainstream consumption in the next 12 months, so hopefully these bugs will be fixed and we'll see improved app support. But what of early adopters that fancy the look of the Meizu MX4 Ubuntu Edition? It's a very decent phone, but unless you want a buggy operating system (with little app support at the moment), then I'd recommend getting the Android version, and holding tight on Ubuntu Phone just for now.